Gillian Bush, Psy.D. is a Florida Licensed Psychologist (PY8940) who specializes in the treatment of anxiety and eating disorders. 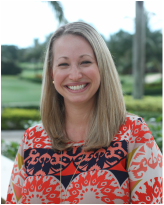 Dr. Bush received her Masters degree from Teacher's College, Columbia University in New York, NY and received her Doctorate degree in Clinical Psychology from Nova Southeastern University in Ft. Lauderdale, Florida. Dr. Bush has extensive training in skills-based Cognitive Behavioral Therapy (CBT) treatments for Social Anxiety, Obsessive-Compulsive Disorder, Panic Disorder, Generalized Anxiety Disorder and Specific Phobias. Furthermore, her pre-doctoral internship and post-doctoral residency training was focused on the treatment of eating disorders (Anorexia Nervosa, Bulimia Nervosa, Binge Eating Disorder, and Other Specified Eating Disorder). In her time with The Renfrew Center, Dr. Bush developed her proficiency in utilizing the most current and time-limited approaches, such as Motivational Interviewing abd Acceptance and Commitment Therapy (ACT), in addition to CBT and Dialetical Behavior Therapy (DBT). Dr. Bush is currently a private practitioner helping her clients learn to better monitor and regulate their thoughts, their feelings and their lives. Dr. Bush uses an integrative therapeutic style which ensures that every client is receiving treatment that is individually tailored to his or her specific needs at that time. Dr. Bush prides herself on "meeting her clients where they are" and working towards creating a collaborative vision for the future. She acknowledges that therapy takes a significant investment (both financially and time-wise) for the client and as such, her focus is on maximizing take-home skills and helping the client to translate the work within her office into their lives. Dr. Bush is also a firm believer that talking about a problem is not always enough. As such, she often incorporates real life, "in-vivo," opportunities for patients to face their fears and learn how to utilize skills in real experiences. Dr. Bush also sits on the Board of Directors of the Alliance for Eating Disorders, a nationally recognized non-profit organization that focuses on advocacy, outreach and assistance for individuals and families with eating disorders. In this capacity, she works actively to promote access to care and spread awareness of the need to fight the stigma attached to eating disorders. She is the chair of the Education and Outreach Committee at the Alliance, connecting professionals in the community with the Alliance's services. Further, Dr. Bush serves as an Assistant Supervisor at the Alliance for Eating Disorder's new Psychological Services Program, an outpatient treatment program for the under-insured and uninsured in the community. Finally, she also runs a weekly support group at the Alliance office for adults in various stages of recovery from eating disorders. If you are interested in this support group, other eating disorder support groups, the Psychological Services program or more information about the Alliance, please see the Alliance website. Dr. Bush is a mother to two young boys, a student of yoga, as well as a swimmer and cat lover. She loves to use metaphor and imagery to enhance learning and insight in sessions, and believes above all else, that the relationship between herself and her clients is of the utmost importance. She is eager to hear from you. Call or email her now to set up your free initial telephone consultation.